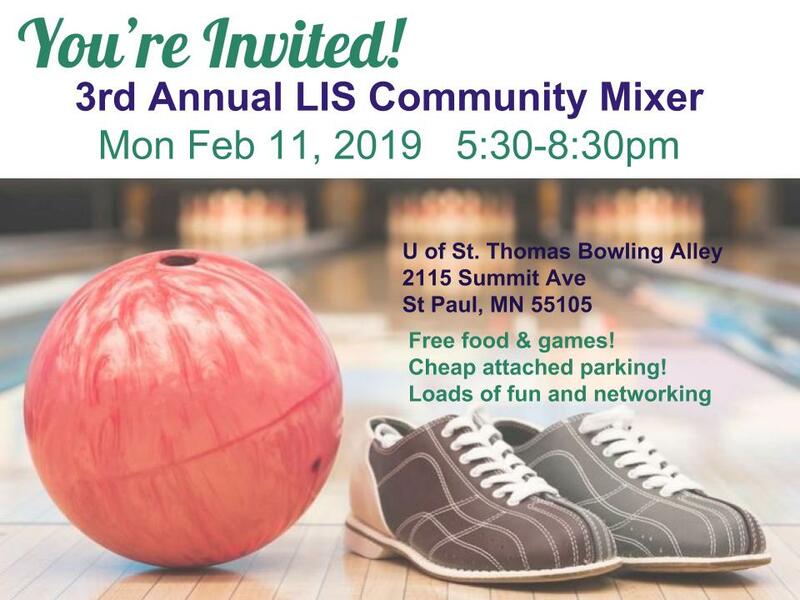 The 2019 LIS COMMUNITY MIXER will be on February 11 at 5:30 p.m. This FREE event brings together St. Kate’s MLIS student groups, local professionals, and faculty/staff for networking and fun. Bowling, darts, skeeball, snacks and more! This event brings together members of St. Kate’s MLIS student groups, local professionals, and MLIS faculty and staff to facilitate stronger relationships between our organizations and the local LIS community. Meet and connect with local librarians, archivists, and information professionals. Come for the free refreshments, cash bar, many games, no-fuss networking, AND BOWLING! The St. Kate’s MLIS Student Governance Organization (SGO) is the representative body for all MLIS students, acting as a liaison to and advocate for students in the MLIS program, the faculty, and the university as a whole. 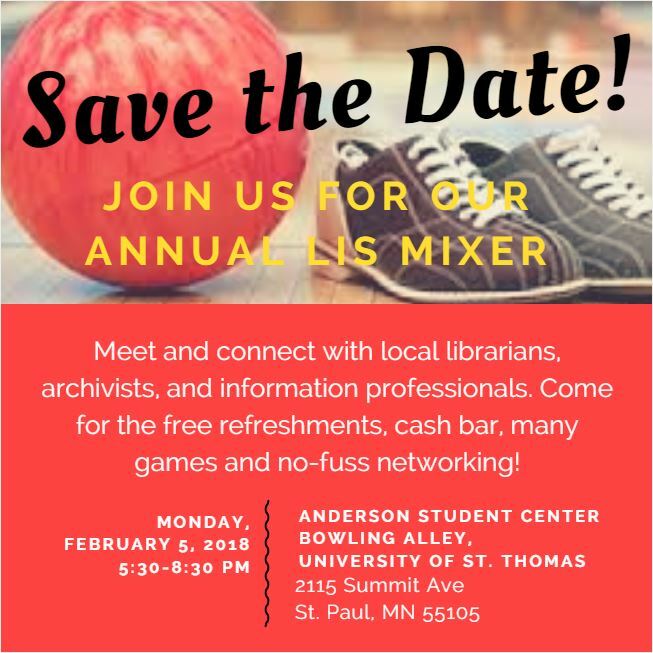 Don’t miss the LIS COMMUNITY MIXER, Feb 5, 2018 at 5:30. This FREE event brings together St. Kate’s MLIS student groups, local professionals, and faculty/staff for networking and fun. Bowling, darts, skeeball, snacks and more! Info & RSVP here! If any apply, this event is for you! Hosted by graduate student David Norris, this 90 minute event includes an overview followed by Doctors Heidi Hammond, Joyce Yukawa and Tony Molaro sharing the requirements and finer points of ePortfolio for both MLIS and SLMS. We’ll round out the session with plenty of time for Q&A.